The discipline of planning, organizing, securing and managing recourses to bring about the successful completion of specific project goals. A temporary endeavor having a defined beginning and end. Typically constrained by date, but also includes funding and deliverables. A Project is temporary by nature and contrasted from business as usual. Things in business that are repetitive, permanent or semi-permanent, work to produce products or services. Business as Usual and Projects are two different aspects of business and are normally found to be quite different and thus require development of distinct technical skills and separate means of management. The challenge of project management is to achieve the project goals and objectives while honoring the preconceived project constraints. The typical constraints are scope, schedule, and cost. 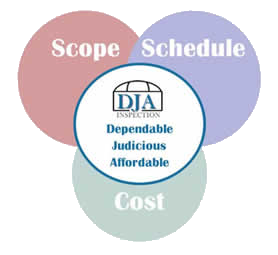 It is the goal of DJA Inspection Services, Inc. to provide Project Managers and support that will enable your project to meet all preconceived constraints. DJA Project Managers will be found to be Dependable, Judicious and Affordable. Regardless of the approach employed, DJA will give careful consideration to the overall project objectives, schedule and cost. DJA will consider the roles and responsibilities of all the project participants and the owner. DJA utilizes three approaches to project management depending on the needs of the owner and the project. The traditional approach - Project initiation; Project planning and design; Project execution; Project monitoring and control which if need can return to project planning; and Project completion. Critical Chain Project Management - This method places more emphasis on the physical components and people needed to execute project tasks and objectives. To follow this management approach one gives the tasks on the critical chain priority over all other activities. To accomplish this, the projects must be planned and managed to ensure that the resources are ready when the critical chain tasks must start. Probabilistic moment of risk - An activity or task in most real life processes is not a continuous uniform process. Tasks are affected by external events, which can occur at some point in the middle of a task. Event chains - Events can cause other events, which will create event chains. These event chains can significantly affect the course of a project. A quantitative analysis is used to determine a cumulative effect of these event chains on the project schedule. Critical events or event chains - The single events or event chains that have the most potential to affect the project are the "critical events" or "critical chain of events." The determination of these is made from continual analysis of the project. Project tracking with events - Even though the project is only partially completed, data about the project duration, cost, and events occurred are available. With the available data it is possible to refine information about potential events and help to forecast future project performance. Event chain visualization - Events and event chains are visualized by an experienced Project Manager. By utilizing the charting of events that have occurred he can predict future events and plan accordingly. Measuring the ongoing project activities - where are we in the project? Is the project on a daily, weekly or monthly basis? Monitoring the project variables - cost, effort, scope - where should we be? 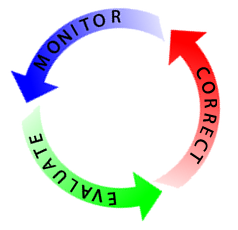 Identify corrective actions to address issues and risks properly - keeping on track. This revolving analysis by the Project Manager continues until the project is deemed complete. DJA closes all projects with a complete and detailed report of the activities that were done. Supporting documentation for all certified personnel used on the project, and certification of materials used. A completed arrow diagram of the actual project as well as a comparison diagram from the initial planning. The Project Manager will give his/her explanation of all deviations from the original plan of action or arrow diagram. DJA management believes that a complete project analysis will allow you to conclude your project at or below the projected total cost. Our Management understands that many factors go into the actual cost of a project including downtime and loss of business. Many contractors consider only their cost and concerns; this is why it is important to select a project manager who will consider the overall impact of the project and work to minimize your costs. Copyright 2011 - 2019 DJA Inspection Services, inc.